The Quillota Province (Spanish: Provincia de Quillota) is one of eight provinces of the central Chilean region of Valparaíso (V). Its capital is the city of Quillota. The Quillota province is the second smallest province in the Valparaíso region with an area of 1,113.1 km2 (429.8 sq mi); only the Isla de Pascua province is smaller. The Quillota province is bordered to the north by the Petorca province, to the east by the San Felipe de Aconcagua province and the Santiago Metropolitan Region, and to the south and west by the Valparaíso province. As of 2002[update] (last national census), there were 175,917 people living in the province, giving it a population density of 158.0 inhabitants/km². The largest city of the province is Quillota, its capital, with a population, in 2002, of 62,231 inhabitants. 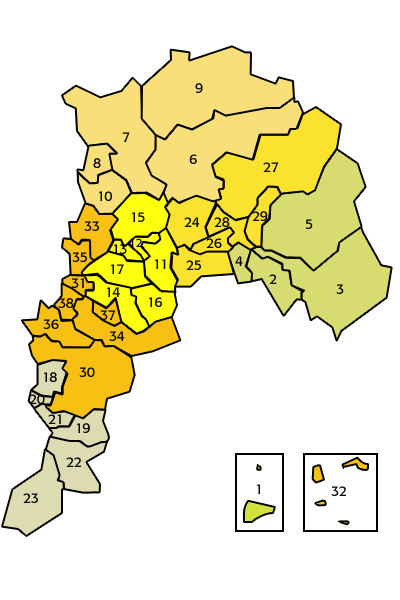 As a province, Quillota is a second-level administrative division, consisting of five communes (comunas). The city of Quillota serves as the provincial capital. The province is administered by a governor. The comunas Limache (number 14 in the map) and Olmué (number 16 in the map) were transferred to the Marga Marga province in 2010. ↑ "Conozca al Gobernador". Gobernación - Provincia de Quillota (in Spanish). Retrieved 25 August 2017. ↑ 2.0 2.1 2.2 2.3 2.4 2.5 2.6 "Región de Valparaíso" (PDF). Instituto Nacional de Estadísticas. Retrieved 25 August 2017. This page was last changed on 14 November 2017, at 21:57.